Spring Detox Workshop - April 17th. Details below! Sign up for this Spring Detox workshop where you will create a Personalized Detox Regimen that will strengthen your body's detoxification ability and boost your individual health and wellness goals! Whether you are looking to trim down a size or two, increase your level of energy naturally or improve your sleep patterns, a gentle daily detox regimen can ramp up your efforts and help you optimize your health! Each participant will be well prepared with their personal Spring Detox Plan which they can get started on the moment they leave the classroom! There will be Spring Detox Gift Bags for each participant too! Day: Wednesday April 17th, 2019. Time: Choose the time that best fits your schedule: 1:00 PM or 7:00 PM. The class meets for 90 minutes. Location: The East Grand Rapids Recreation Department, in the lower level. Cost: $35.00 for EGR Residents and $45.00 for Non-Residents. Register: The EGR Rec Department to reserve your seat! 949-1750. Optimize your health with fermented foods! 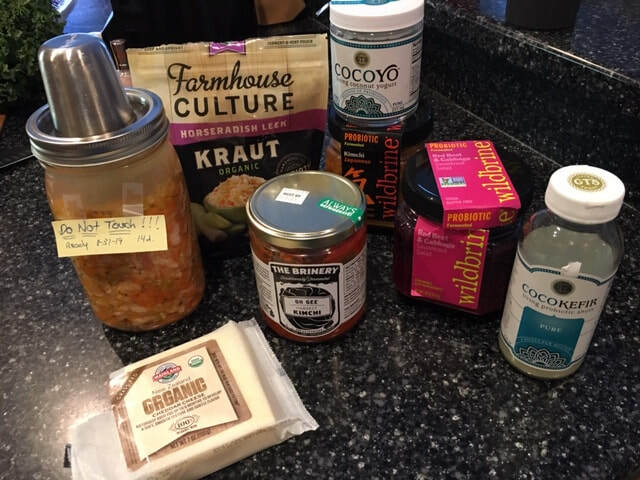 Various Fermented Foods I regularly keep on hand! If you're looking to improve your digestion, boost your immune function and optimize your health status, follow the advice from our top Dr.'s in Functional Medicine and Natural Health, eat Fermented Foods! One of the MANY general recommendations that Functional Medicine Dr.'s make is to consume Fermented Foods (FF) on a regular basis! Naturally Fermented Foods (Sour Kraut, Yogurt, Kefir, Kombucha, Kimchi, Tempeh, Miso, etc.) contain boatloads of beneficial bacteria (probiotics) that can help: improve digestion, increase nutrient absorption, maintain a healthy balance with your gut microbiome, and support optimal immune function! When these systems are functioning well, you can feel an improvement with symptoms like: heartburn/acid reflux, less gas and bloating, your brain fog, mood and fatigue lifting, skin and hair improvements, fewer illnesses, and a more balanced level energy too! If you are trying FF's for the first time, it's important to start with a very small amount (1 t. per day) and increase gradually to one forkful - once per day, or every few days, watching for signs of tolerance! If new symptoms occur, stop consuming the FF and contact a Functional Medicine Dr. in your area. New symptoms associated with FF consumption can indicate a gut microbial imbalance that should absolutely be addressed! You can BUY FF's at Health Food stores! Regular grocery stores usually carry Yogurt and Kefir as well, and sometimes they will have Sour Kraut or Kimchi too! Make sure your Fermented Foods are purchased from the refrigerated section in the store, and kept in the refrigerator at home - to preserve the precious beneficial bacteria! Sour Kraut that sits on a regular grocery store shelf at room temperature was not naturally fermented and does not contain any beneficial bacteria! Also, if you'd like to assure you are getting the most probiotic rich source of FF, consider making your own at home! Using a Kraut Source Fermentation Cap on any wide mouth Mason Jar really makes the fermentation process easy and stress free! You simply wash, chop and mix your vegetables with seasonings of your choice and a salt and water brine, then let it sit in a dark corner on the kitchen counter (away from heat) for anywhere from 10 to 14 days (depending on your taste and texture preferences). More specific instructions come with any Fermentation Cap you purchase! Lastly, as Dr. Tom O'Bryan, Author of the Autoimmune Fix, Functional Medicine practitioner and Gluten Sensitivity Specialist recommends "Consume a variety of Fermented Food's, taking one forkful from a different kind each day!" Following this recommendation, I try to keep three different kinds in my refrigerator at all times! This is a fantastic way to broaden your consumption of beneficial bacteria, which will help maintain a healthy microbial balance in the digestive tract! And supporting a healthy microbial balance is a step in the right direction to support good health! 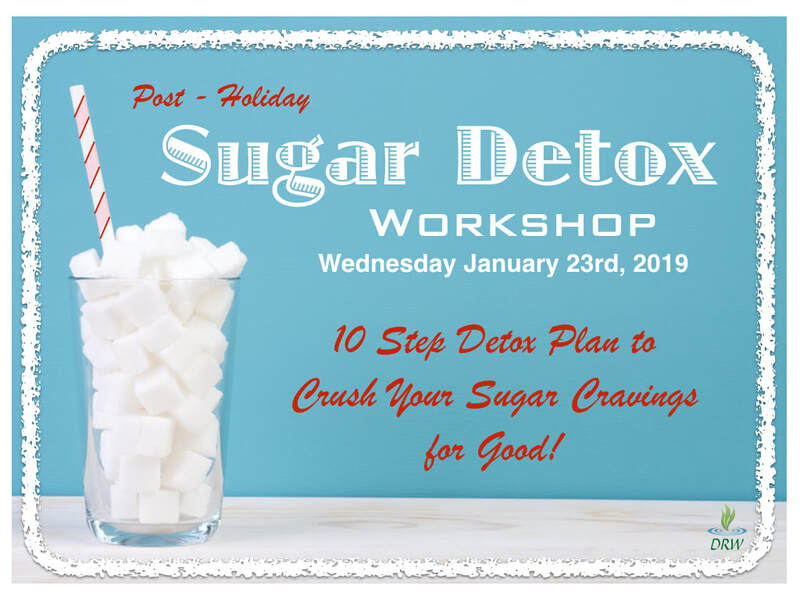 Post-Holiday - SUGAR Detox Workshop - January 23, 2019! In this hands-on workshop, you will be guided to create a personalized 10 Step Sugar Detox Plan, one that best fits your individual wellness goals, preferences and lifestyle! Your personalized plan will equip you with several sugar busting strategies - designed to help you control your cravings for sweets as you wean yourself off of the sugary treats! By the end of the class you will be ready to go with your Personalized Action Plan - which you can put into use the moment you leave the classroom! Not only will this plan help you stay on track with your health goals, it will also help you form new Healthier Habits that can bring lasting results! Additionally, you will receive a Healthy Habits Goodie Bag filled with several useful items to support you on your Sugar Detox mission! And before you know it, you will find yourself passing on the sugary sweets and treats with ease, and moving yourself closer each day to achieving success with your health and wellness goals! Here are some of the improvements that have been experienced by women who have ended their addiction with sugar: weight loss, increased mental clarity, clearer skin, better sleep patterns, more stable mood, improved digestion, and an overall increase in energy and productivity! Don't let sugar hold you back any longer! 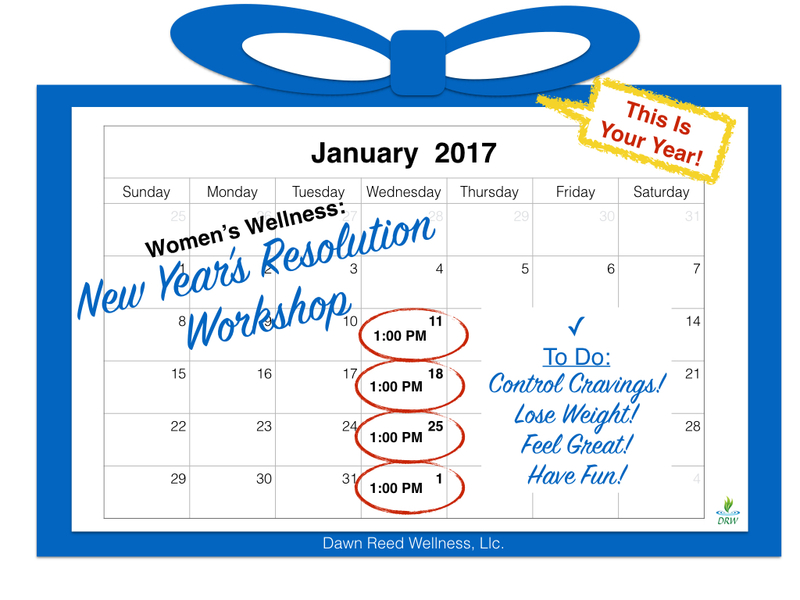 Start your New Year off right with a well designed plan that will jumpstart your sugar detox mission and leave you feeling energized and looking your best! The Post-Holiday Sugar Detox workshop will be held at the EGR Recreation Department on Wednesday, January 23rd, 2019, with two separate class times to choose from: 1:00 PM OR 7:00 PM. Each class runs for 90 minutes. Cost is $35.00 for EGR Residents, $45.00 for Non-Residents. 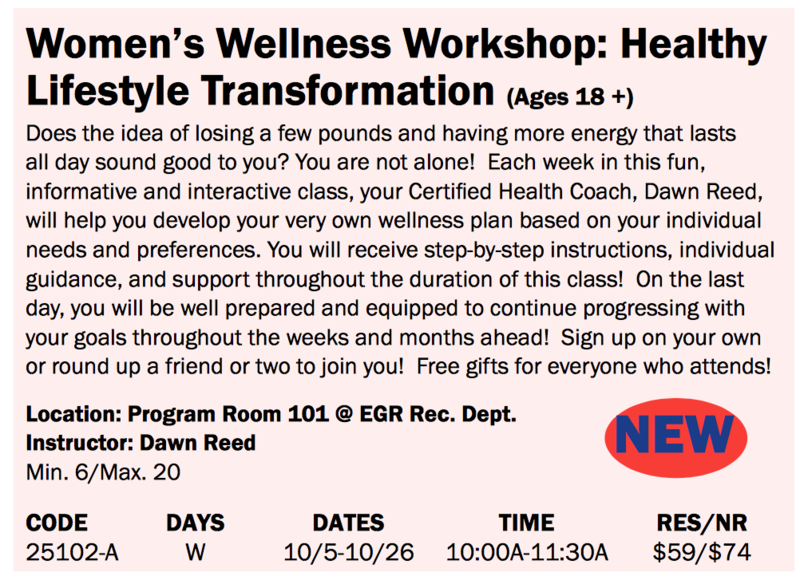 Healthy Lifestyle Transformation - Starts next week, Oct. 3rd! The Healthy Lifestyle Transformation class starts next week Wednesday Oct. 3, at 11:00 AM to 12:30 PM, meets once-a-week, every Wednesday for 4 weeks! Call the EGR Recreation Department to reserve your seat in the class! CLASS DETAILS: Each week I will share health related information with the class, and explain how it relates to achieving your health and wellness goals. Additionally, everyone will be prompted to choose customizable action steps to commit to for the next week, steps that best suit their individual needs. Week by week you will continue learning more about health related strategies and you will continue experiencing more with the additional action steps that you select! As your Health Coach, I will provide guidance, support and accountibility to keep everyone on track... and lead each member of the class to achieving personal success! Women who have taken my Healthy Lifestyles Transformation class in the past have reported: Increased levels of Energy, Weight Loss, Improved Sleep, and Sugar Cravings Reduced! And all have felt fully supported having a Health Coach guiding them each week on their journey and keeping them on track! In addition to sharing tips, tricks, recipes and strategies that will help you on your journey, I will share what the experts in the fields of Natural Health, Wellness and Nutrition are currently reporting for Preventive Health measures! Topics like Microbiome Health, the Gut-Brain-Body connection, Bio-individuality, Whole Lifestyle Balance, and the importance of Digestive Health will all be introduced. We will also tap into the Gluten Free movement and you will learn of the many mysterious signs and symptoms of Gluten Sensitivity, and theories as to why this movement has gained so much momentum! Receiving support from a Health Coach to address your individual goals - is the main focus the class, and the information you will receive and the fun you will have with the women in the group are the icing on the cake! ​Reserve your seat today! Call The EGR Recreation Department: 616-949-1750. Each week in this interactive workshop I will bring you up to speed on current, relevant and very beneficial health and wellness concepts that you can implement and embrace as you work towards to addressing your individual health concerns. Additionally, I will guide you through a series of customizable action steps, and support you as you begin making progress with your individual goals... STARTING ON DAY 1! This is the class to get you off and running with great clarity and steady momentum that will keep you on track with your health goals through the weeks and months ahead! Guidance, support and accountability from a Health Coach are the keys to your success, and it is my pleasure to provide this service to you! Healthy Lifestyle Transformation workshop STARTS October 3rd, 2018 from 11:00 AM to 12:30 PM. Our group will meet each Wednesday at the same time, for 4 weeks (October 3, 10, 17, 24). 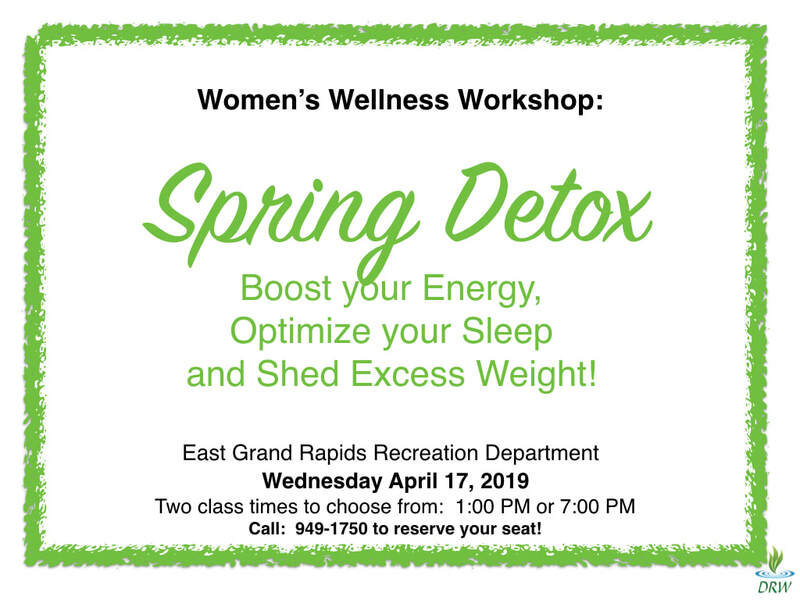 Spring Wellness Classes at the EGR Recreation Department! 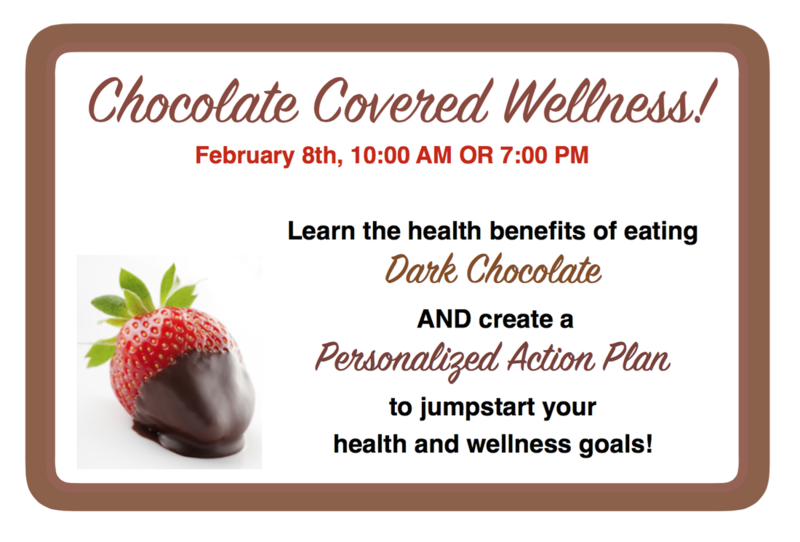 Chocolate Covered Wellness, February 8th, 2017! Are you having a little trouble getting motivated with your 2017 health goals? Sign up for this class and discover the health benefits of eating dark chocolate while I guide you in developing a plan to address your individual health goals! Choose one of the two class times to attend: Feb 8th at 10:00 AM OR 7:00 PM at the EGR Rec Dept (class runs 90 min.) Get serious with your health goals and have a little fun with a free chocolate tasting! Sign up today for this Women's Wellness Workshop! It starts January 11th, and meets once-a-week for 4 weeks, from 1:00 PM to 2:30 PM, at the EGR Recreation Department. Your Health Coach Dawn will guide you through the program each week and help you create and implement a workable Plan-of-Action to advance you towards achieving your Health and Wellness Goals! You will dramatically increase your chances for SUCCESS by working with a Health Coach who provedes supportive information, workable action-steps and consistant accountibility! Sign up today! 949-1750. Plan Now for a healthy holiday season! With the holiday season comes lots of holiday gatherings, lots of delicious holiday foods, and many opportunities to fall off track with your health and wellness goals. With a little thought and preparation in advance, you can set yourself up for a successful Healthy Holiday Season! Check out my tips below, embrace the one's that reasonate with you, and enjoy a Happy and Healthy Holiday! Dawn's Top 10 Tips for Staying Healthy Throughout the Holidays! Fresh Fruit, Honey, Lemon juice, Oatmeal, etc. of over-indulging in non-nutritious foods. choosing mostly healthier foods first, then indulge in one of your favorite sweet treats. 90/10 rule = 90% Healthy Foods/10% Treats! prevent you from stopping last minute for fast-(junk)-food! for more time to relax and enjoy time with your family and friend. This class meets once a week for 4 weeks. Call 616-949-1750 to reserve your seat! To automatically receive updates on my Blog posts, click on RSS Feed!